Our trade quality window cleaning ladders are manufactured from heavy duty aluminium and are designed to withstand day in, day out use. They also Include a FREE rubber top block to prevent damage and not mark your customers walls and windows. These are a costly optional extra (seen for as high as £30!) with our competitors. Trade quality ladder with maximum load of 150kg (23.5 stone). Ladder goes into a point at the top (A-shape) to allow it to be rested on and into the corner of window frames. FREE rubber top block fitted to the top of the ladder – a costly extra with some of our competitors. These blocks are non marking and prevent damage to window frames, sills and surrounding walls. Fitted with non-slip deeply serrated rungs for maximum grip and sure footing when climbing and working from the ladder. In addition our rungs are set only 25cm (10 inches) apart making for a much easier and more comfortable climb when compared to competitors ladders. Most rungs are usually positioned 28cm (11 inches) or even 30cm (12 inches) apart making them a great deal harder to climb, especially when using them all day long. Super strong but lightweight “aluminium” construction means the ladder can take the rough treatment of daily work but is also easy to transport from window to window, job to job. Also being manufactured from aluminium means it will not rust. Non slip rubber feet fitted at base for maximum grip and stability. Ergonomically designed stiles / side rails provide a comfortable and safe handhold. The bottom section of the ladder is splayed for utmost stability. Also the bottom section is fitted with a large roller guide at the top for easy and effortless opening and closing of the ladder. You can also remove the top section so it can be used as a single section window cleaning ladder. Manufactured from heavy duty Aluminium in the UK for your peace of mind. 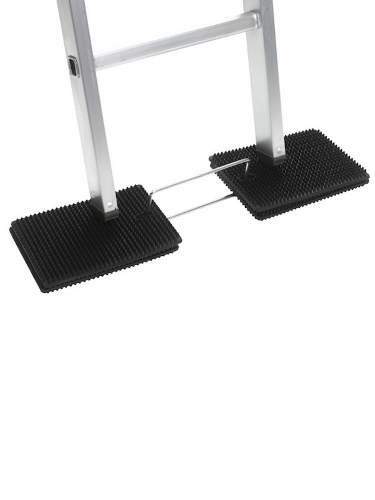 Trade quality ladder which holds a massive weight rating of 150kg. We only sell top quality ladders and have carefully selected this range of products so you can be sure you are buying the best! Manufactured abroad from weaker materials. Not trade quality and poorly built means there is a real quality and safety issue. Great value, top of the range, ladders that offer the best combination of quality and value for money. Our customers love these ladders, as evidenced in the many FIVE STAR reviews from our independent survey. We supply the rubber top block, completely free of charge – unlike our competitors. Very few, if any, other retailers offer this great value in what is a superbly constructed product. Top block is an additional charge, driving up the cost of your purchase. We are the UK Ladder Experts having sold many thousands over the past 15 years. Massive stocks always held for next day delivery, all backed up by our knowledgeable sales teams and celebrated aftersales service. Check out the superb customer reviews received through the independent agency FEEFO. We are open 7 days a week (weekdays until 9pm) to provide product advice and take your order. We also trade through multiple channels so you can make a purchase 24/7. Our telephone lines are NOT charged at a premium. Our Window Cleaning Ladders are made by a well-established UK manufacturer, giving you complete peace of mind when choosing your product. Non-slip, ridged rungs provide maximum grip when using the ladder – very important in the window cleaning industry. Some of our competitors sacrifice safety for a cheaper build quality – something we will never do. Smooth rungs are a safety hazard when wet – not ideal for when you’re cleaning windows. We can’t find a competitor who supplies these Window Cleaning Ladders at anywhere near our prices. If you do, please let us know as we refuse to be beaten on price! Others charge for delivery or your ladder will take up to 5 working days to reach you. Comprehensive manual supplied. You also have the reassurance of being able to speak to one of the experts in our Customers Services Team if further assistance is required. Poorly written instructions or none at all which can render the ladder unsafe if not understood. Lightweight but very strong alloy construction and great design gives our ladder these unique features and ensures the ladder suitable for use by almost anyone. Aluminium construction means ladders will not rust and can be stored externally if needed. Heavier ladders are difficult to use and no stronger than ours. Some made out of steel, which will rust over time – a lot quicker than normal in the window cleaning trade. Our Anvil Roof Rack Ladder Clamps provide you with a safe and easy way to secure and transport your ladder. As an added feature, each clamp can be locked for extra security. Our Rhino Safe Clamps have revolutionised the ladder clamp market. 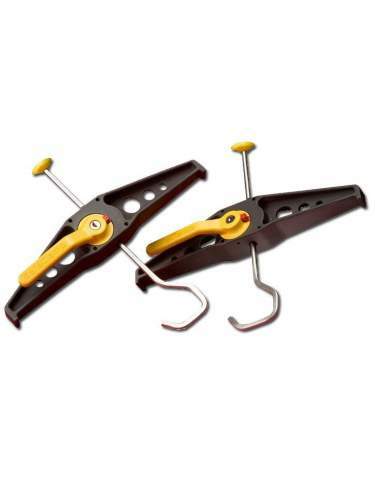 The simple lever lock operation releases 5 times faster than traditional, screw-down ladder clamps. They also include integrated key locks for extra security. Our Universal Levelling Mat provides the perfect solution to uneven or sloping ground. They are supplied as four non-slip heavy duty rubber mats, providing up to 6.5cm of adjustment. Our Laddertag sets are essential for ladders used on site. Our Complete Box Set includes: 10 Holders 20 Inserts and 1 Pen. 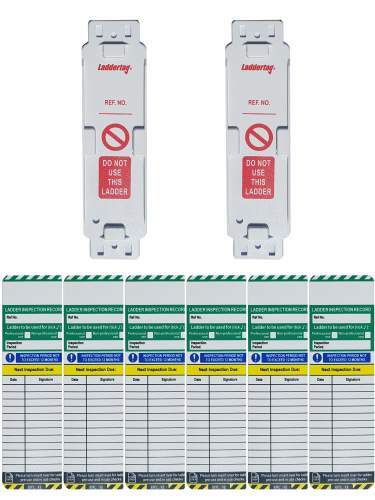 Our Laddertag sets are essential for ladders used on site. 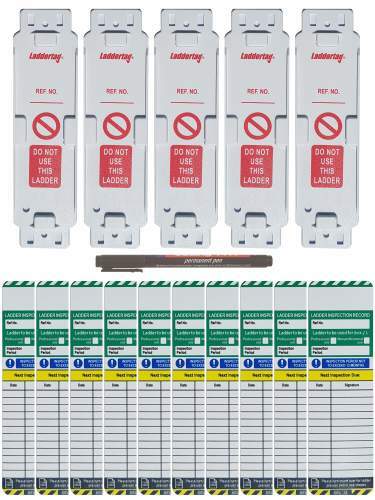 Our Large Company Set includes: 5 Holders and 10 Inserts. 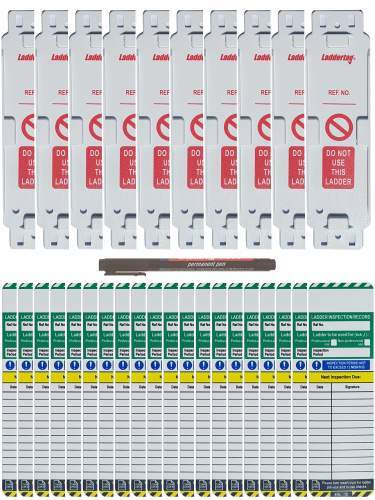 Our Laddertag sets are essential for ladders used on site. Our Medium Company Set includes: 3 Holders and 8 Inserts. Our Laddertag sets are essential for ladders used on site. Our Small Company Set includes: 2 Holders and 6 Inserts. 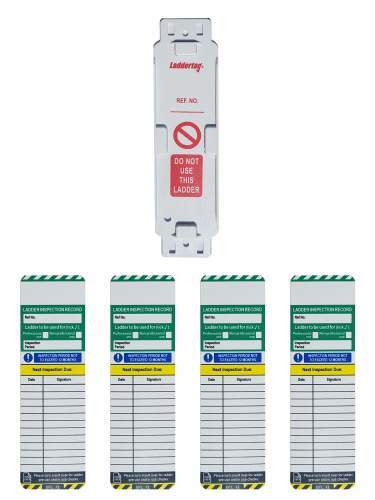 Our Laddertag sets are essential for ladders used on site. 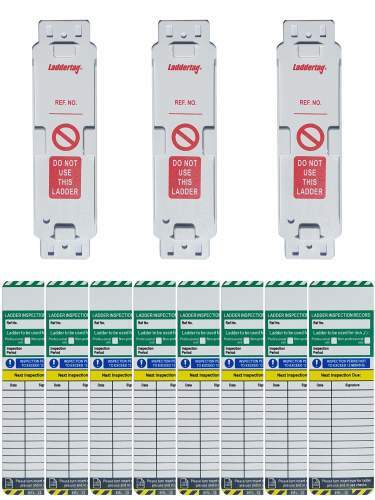 Our Individual User Set includes: 1 Holder and 4 Inserts. How much do the ladders weigh? This depends on what size you choose. Take a look at the bottom of the webpage, where we give details on the weight of each size ladder. Can the ladders be stored outside? Yes they can. The ladders are made from aluminium, so they will not rust if left outside. However if you are storing this way, it might not be a bad idea to put a cover over them.